Week 12 Late Games & Monday Night: No JuJu! Our notes are a bit late this week, sorry about. After wonderful Thanksgiving celebrations full of good food, drink and compayny, it has taken two days to recover from watching the Redskins/Giants suckfest Thursday night. Early games are coming later this evening. I have not seen anything from Seattle to justify them being a 6.5 favorite on the road. The only way the team can generate offense is if Russell Wilson gets flushed out of the pocket and makes plays up on the fly. This is the NFL though, not playground tackle football. Eventually, Wilson’s luck will run out and he’s no look heaves down the field will be intercepted or he’ll get hurt trying to extend a play. 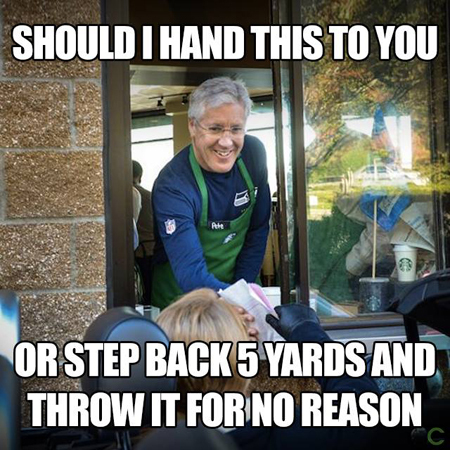 Either that or Pete Carroll will make another bone-headed play call like going for a fake field goal with 7 seconds left and no timeouts. Nope that play didn't lose them the game and Atlanta's D made a great play to stop it, but probably a little bit too risky when they could've just taken the 3 points. Oh, I forgot they have Blair Walsh kicking FGs...good call Pete. San Francisco is coming off a bye and is currently riding a one game winning streak. Sure, that’s their only win and it came against the Giants. But it’s a step in the right direction and just what this team needed heading into a battle against its #1 rival. Not sure the 49ers have enough to win this game, but they are going to keep it close enough that the 6.5 points will cover. Jacksonville is coming off a tough game in Cleveland. Neither snow, nor sleet, nor the QB play of Blake Bortles could keep the Jags D from covering the 7.5-point spread. Two late sack fumbles secured the win and the second resulted in a defensive touchdown and an improbable cover. The Browns again fall victim to the work of Keyser So-So. Arizona will again start Blaine Gabbert behind a banged-up offensive line. Not good news for the Cardinals. Jags will be without Jalen Ramsey so Arizona will try to air it out but John Brown is out for Cards which is a big loss in the passing game. Expect the Jacksonville D-line to destroy the Cards O-line and take over control of this game. Gabbert will make some big mistakes and Jags should come away with an easy W.
New Orleans did not deserve that win last week. Down 15 with under 3 minutes remaining in the game, New Orleans mounted a ridiculous comeback to get the game to overtime. Aided by a suspect intentional grounding call that stalled Washington’s last drive, New Orleans needed only 3 plays in OT to kick the game winning FG. Drew Brees completed 11 of 11 passes on the final two drives and complained to the refs on every play. It was fairly evident that Washington just had nothing left at the end of the game and the Saints took advantage. This week will be a much tougher task for New Orleans as they head out to LA to face the Rams. No Robert Woods for the Rams this week as he is out with a shoulder injury. Maybe they will throw the ball to Sammy Watkins who is consistently open down the middle of the field. Saints are missing two defensive backs which should allow Goff to make plays down the field. The Saints luck on the defensive side of the ball will run out and the Rams should be able to score some points. We’re taking the short home favorite to win ending the Saints winning streak at 8. This line is just flat out wrong. Why is Oakland favored here by 5.5? I know Denver has not looked great the last few weeks, but neither has Oakland. Oakland fired Defensive Coordinator Ken Norton, Jr. which led to two of the best players on Oakland’s defense skipping practice in protest. That’s never a good sign. The team downplayed it and didn’t punish either player. That never ends well. Denver’s QB play has been so bad that they are turning to Paxton Lynch. Apparently, the Broncos have finally had enough of Osweiler giving away games. All Lynch will need to do is not make horrendous mistakes (see Osweiler’s goal line INT last week) and hand the ball off. Denver should be able to run the ball on Oakland’s D which ranks near the bottom of the league against the run. We think Denver wins this game outright, so we’ll gladly take the Broncos and the 5.5 points. Pittsburgh has an uncanny ability to play down to its opponent, especially on the road. For example, a 17-14 win @ Browns in Week 1, a 23-17 loss @ Bears in Week 3 and a 20-17 win @ Colts in Week 9. But at home, this team always come to play. The Steelers are 3-1 at home this season with the only loss at the hands of the Jaguars. Green Bay has been pretty bad since losing Aaron Rodgers to injury. Replacement QB Brett Hundley has thrown 7 INTs against 2 TDs. Pittsburgh is 5th in the league with 12 INTs on the year. They should be able to pick up 2 or 3 more this week with Hundley throwing the ball. With JuJu Smith-Schuster already ruled out, Pittsburgh will rely on Bell and Antonio Brown. Will JuJu’s production on the field will be missed, the bigger loss will be him not being on the field to lead the touchdown celebrations. Antonio Brown’s celebrations will again take center stage. Maybe we’ll see the Pepsi Charleston. There should be plenty of opportunity for Brown & Bell to workshop their TD celebrations. With JuJu out for the game, we might even see Martavis Bryant get to join in on the reindeer games. Nah, who are we kidding, they still won’t throw him the ball. Baltimore’s defense has been playing very well making all Ravens game a race to see if the defense can win the game before Flacco gives it away. Similar to Blake Bortles in Jacksonville, Flacco has done everything in his power to lose games this year. Flacco is the master of garbage time stats and the king of the backdoor cover. Flacco has been responsible for so many back door covers that MeUndies should hire him as its new spokesman. But this week, Baltimore is a big favorite giving Houston 7.5 points. We think this line is too high – even for a Tom Savage led Houston team. Look for at least four FGs from Justin Tucker and one TD from Baltimore’s defense or special teams. On the other side of the ball, we expect a TD from Houtson’s defense likely on a Clowney sack, scoop & score and a TD from DeAndre Hopkins likely ripping a sure interception away from two defenders. Ravens may win, but 19-14 means a cover for the Texans and another win for the good guys.